When CNN’s article regarding the JAMA radiation letter first hit the CANA newsfeed on February 26, 2019, we knew immediately it would be a big deal. And yes, the story has become a many-headed hydra of confusion, concern, and misinformation, accompanied by increasingly scary rumors. We constantly field concerns from suppliers about cremated remains placed inside keepsakes, from crematory operators and embalmers about their cases, from families about their options, from regulators about all of the above, and from you — in the middle of it all — trying to serve your families, comply with regulations, and protect your staff. CANA has curated several of the most useful questions in one place to counter some of the fear, anger, and rumors. And it’s all publicly available, so please share this resource far and wide, bookmark it for later reference, come back to check for updates, and, most of all, DON’T PANIC. The radiation misinformation saga began with a research letter, titled Radiation Contamination Following Cremation of a Deceased Patient Treated With a Radiopharmaceutical and published on February 26, 2019 in the Journal of the American Medical Association (JAMA). In the letter, Dr. Nathan Yu (et. al) discussed a case study of a business in Arizona that cremated a 69-year-old man with pancreatic cancer in 2017. The deceased had been treated with a intravenous radiopharmaceutical for a pancreatic tumor and died five days later. When the medical staff became aware of the cremation, they notified the crematory and the cremation chamber, equipment, and staff were all tested for exposure to radiation. The equipment was found to have traces of contamination, as was a urine sample from one crematory operator (but it was a different isotope from the one used in the patient’s treatment). The contamination levels were below the limits set by the US Nuclear Regulatory Commission. In conclusion, because this is only one studied instance, researchers recommend further testing for more data and better understanding. CNN was the first major media source we found to bring the letter to the general public awareness. To round out the story, the network solicited the opinion of Dr. Daniel Appelbaum, chief of nuclear medicine and PET Imaging at the University of Chicago Medical Center. He said, "If there are reasonable and fairly straightforward and simple things that we can do to minimize radioactivity, why not do that?” Applebaum also acknowledged the need for better understanding and regulations that keep workers safe. In the case of crematory operators, the doctor recommends "robust enforcement of mask and gloves and handling techniques." Other media outlets picked up the story and it spread quickly, with information traveling like a game of telephone. My mother’s church group argued against cremation for spreading radiation in the community. One CANA member’s staff are expressing concerns about “the crematory operator who died from radiation” (when none have). Each of which are exaggerated concerns about what we know. Because while the case study is new, the knowledge about radiopharmaceuticals and brachytherapy is not. And the medical community is quick to reassure that there is Low Risk of Radioactive Contamination from Cremation When Proper Safety Procedures Followed. CANA is aware that these concerns and fears are rooted in a lack of awareness and understanding, so we want to provide information to help. Nuclear medicine, as administered by a medical professional, is very different than a nuclear warhead. These treatments are administered at doses for safe and healthful diagnostic imaging and cures, not mass devastation. These treatments have known efficacy windows which range depending on the use. Diagnostic imaging (e.g. PET scans) can take 20 minutes to 67 hours to clear the system. Radiopharmaceuticals can take 3-12 days (this is where the case study falls). Radiation oncology, like brachytherapy, implants treatment into the body to deliver targeted doses over a treatment window and these isotopes can take weeks or months (or longer) to decay to acceptable exposure levels. The variations in the length of radiation are due to different materials (called isotopes) used in treatment and their half-lives (i.e. how long it takes the radiation to degrade to half its original mass). Safe levels are determined by federal regulation. For the US general public, this is anything up to 100mrem in a year (excepting medical treatment — a full-body CT scan provides approximately 1,000mrem), while for people who work with the substances it’s 5,000mrem each year. A fatal dose is more than 500,000mrem. And we are exposed to radiation by taking an airplane, using the microwave, and from nature (both Earth and space). Radiation treatments also vary in strength. Alpha waves are stopped by paper, or blocked by your skin. Beta waves are blocked by soft tissues and thin metal of aluminum. Gamma waves travel much farther. Distance from the radioactive material also changes exposure — the medical community measures the potency at one meter to determine when a patient can go into public spaces. In most of the cases described above, treatment is outpatient (even the implanted seeds) meaning the person can leave that day. The US Nuclear Regulatory Commission has set specific levels (mentioned above) to regulate emissions and uses. In the case of cremating a body treated with nuclear medicine, the Commission and medical community agrees that the potential exposure is too low to record. 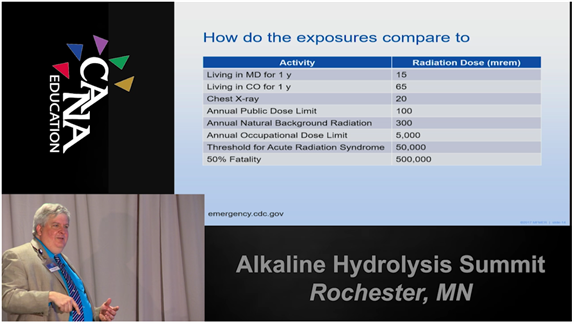 Though cremation volatilizes the radiation treatment, Brunette says even extreme cases are not likely to exceed the limits set for safe exposure due to the combination of medically accepted isotopes, their half-lives, and treatment use. He explains it with an analogy: taking a daily recommended dose of aspirin is fine (around 325 mg) but taking a year’s worth at once (118,625 mg or more than three bottles) is fatal. Canadian Nuclear Safety Commission has their own rules and regulations and reviewed them extensively last year. 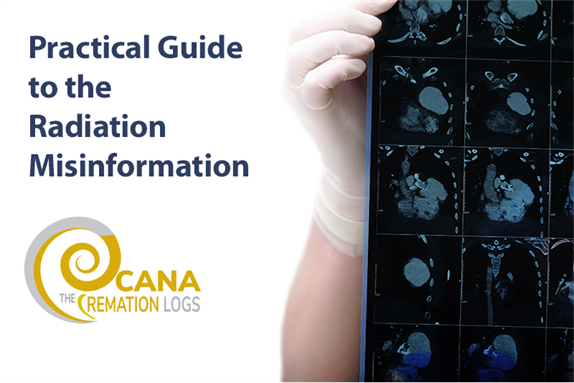 CANA recommends their comprehensive Radiation Protection Guidelines for Safe Handling of Decedents as a great resource to learn more about the isotopes in question and safe handling procedures, even for non-Canadians. Ultimately, Brunette argues that radiation is a limited concern because the levels you will encounter on the job are small, and not very common. Your bigger concerns are the activities that your staff do every day: musculoskeletal injury from lifting, exposure to disease during embalming (HIV; Hepatitis B & C; Tuberculosis; MRSA), and exposure to harsh conditions during cremation operations (heat, noise, dust or chemicals). How can we operate safely? CANA recommends asking all families for detailed medical information to properly understand and respond to potential risks. Just as you ask about the presence of pacemakers, ask about nuclear medicine treatments. Paul Harris of Regulatory Support Services encourages all funeral home, crematory, and cemetery owners to ask the pertinent questions of their families. Cause of death is the first indicator that a case is at risk for radiation therapy, but all families should be asked in the case of death unrelated to their ailment. In many cases, families may be unaware or not understand the procedures the decedent has undergone. In these cases, you may need to ask for a Health Insurance Portability and Accountability Act (HIPAA) release form (in the US, rules in Canadian provinces vary) to contact the medical provider yourself. Asking the radiologist for information on the treatment and about the specific isotope and its half-life is the best way to determine when (or if) it is safe to cremate or embalm the body. The medical community also recommends installing a simple radiation detector to quickly alert staff to the presence of radioactivity (some states require them in all morgues). Brunette recommends a pancake Geiger-Mueller counter which can be acquired cheaply (particularly if you have them left-over from the old nuclear-powered pacemaker days) and built into your case acceptance procedure. Awareness: Talk to families, ask the radiologist, consider purchasing and/or installing detectors. Protection: Wear appropriate PPE when potential for contact with body fluids, cremated remains, or AH fluids. Disposal: Drain blood and body fluids during embalming directly into the sanitary sewer system and don’t aspirate unless necessary. Proximity: Maximize distance to the body and minimize time in close vicinity to the body. The medical community should do what Drs. Yu and Applebaum say: research. Learn more about these situations so everyone can make informed choices about safety. In the long-term, this will serve us better than knee-jerk reactions and blanket rules to refuse all cases who have ever been treated. Our professional community should continue to do what you do best: serve your communities safely and compliantly. Enforce PPE, add this to your list of questions for families, do your due diligence. You should review your existing policies, processes, and procedures to ensure that you are screening for the use of radiopharmaceuticals and staff are taking proper precautions. Inform yourself and staff with basic information about diseases that could indicate potential treatments and which isotopes are used. Know who to contact with questions like your local hospital’s radiology department (or the decedent’s doctor) or regulator. Mostly, DON’T PANIC. Now that the public is aware of this issue, this is an opportunity to educate our communities and ourselves with good information from reliable sources. CANA will periodically update this post with new knowledge, so bookmark this for later. 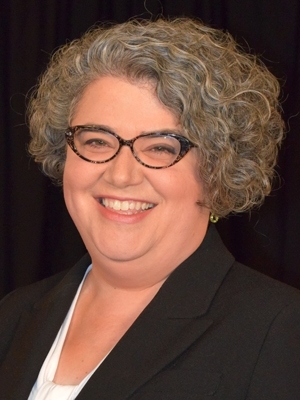 Barbara Kemmis is Executive Director of the Cremation Association of North America.